Sweeten his day with a seductive zesty fragrant from Pure Canvas and romantic Red Roses. This dazzling Pure Canvas Black Edition - Fresh Noir EDT 50ml is captured in a classic ceramic pure Black bottle. Launched recently in September 2018, Pure Canvas Fresh Noir Black Edition EDT is a unisex fragrance that is pure, opulent yet refreshing. Its zest is reminiscent of fresh spring afternoons and summer days spent by the side of French Reviera. Rich, elegant and sensual, the composition contains essence of Lemongrass, which is 100% natural. The opening accords include Vanila, Limonene and Linalool. Design by our very own local talent, Slen Fadzil, this zesty scent is suitable for any confident active player who loves nature and is unafraid of one's sensuality. Fresh flowers applicable for Klang Valley only. 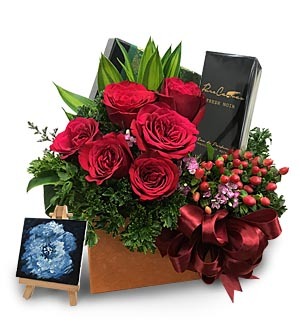 For other States, fresh flowers will be replaced with artificial flowers or non-flower gifts. Kindly provide at least 3 days notice for outstation delivery. Call 03-78830233/+6012-6915200 for more details.